When it comes to real estate in the Greater Phoenix area, we are the experts. Our extensive experience and unparalleled awareness of trends, strategies and movement in the market has helped our clients gain insight in order to make smart, well-informed business decisions. Our ability to understand the strengths and weaknesses of local, national and global influences maximizes our performance and keeps our clients ahead of the pack. For more information, select a market below. Phoenix is the sixth largest city in the U.S. and is booming with entrepreneurial growth and success. The cost of living and doing business in Phoenix is lower than any other major metropolitan area in the United States. The area contains excellent commercial real estate opportunities thanks to Phoenix’s vast attractions and quirks. Downtown Phoenix is the city’s urban core. Roosevelt Row is a growing arts district that attracts tourists and residents for Phoenix’s First Fridays, which allows people to view the art galleries in downtown for free. The Phoenix Suns and Arizona Diamondbacks both play nearby, attracting thousands of people for their games. Small businesses to large corporate hotels take advantage of the influx of people who come in for conferences and on vacation. Industrial real estate is in demand downtown. This small, upscale neighborhood in Phoenix is the perfect place to grow or start a business. In the area, the Arizona Biltmore with its array of shops and high-scale restaurants attract customers. The neighborhood also sees many small strip malls that house local businesses and mom and pop shops. North Phoenix borders the city of Scottsdale and shares similar amenities. Many strip malls have been built to accommodate people as the city of Phoenix grows. This area is home to several malls, medical facilities, etc. Also bordered by the growing city of Paradise Valley, North Phoenix is perfectly situated for any business. Click here for a City of Phoenix Market Report. There’s no better place for a business than Scottsdale. Named “the most livable city,” It is Arizona’s the sixth largest city with a 2010 population of 217,385, growing 7.2 percent from July 2000 to April 2010. Scottsdale is home to Scottsdale Fashion Square, a high-end retail mall that houses upscale stores and restaurants. But shopping isn’t the only fun adventure Scottsdale has to offer. Old Town, the downtown of Scottsdale, is the best place to relax after a long day. Trendy restaurants and bars make Old Town a lively location to go to lunch with co-workers or have a cocktail after work. Scottsdale is also growing its own arts scene. Several museums call the city home including the Scottsdale Museum for Contemporary Art. On Thursdays, the city hosts an ArtWalk for people to visit the Scottsdale Arts District and view the many galleries. Other attractions include casinos and resorts like the Talking Stick Casino. If you want your business to be located in a city with a lot to offer from entertainment to relaxation, Scottsdale is the perfect place for retail and office space. A blossoming business will find the city of Tempe the perfect location for development. Tempe is Arizona’s eighth largest city and is home to more than 161,000 residents. Home to one of the largest universities in the country (Arizona State), more than 60,000 students take advantage of all the shopping and eating opportunities. Tempe is an excellent location for retail space thanks to its large population and amenities. Click here for a City of Tempe Market Report. The city of Mesa is currently a growing hot spot in the Valley. As of the 2010 Census, Mesa is the center of Arizona’s population. Mesa is the third largest city in Arizona and is even larger than Miami, Atlanta and Cleveland. Mesa, located in the East Valley of the Greater Phoenix area is the third largest city in Arizona with a 2010 population of 439,041, growing 10.8 percent from July 2000 to April 2010. It is home to one of four Arizona State University campuses, the Polytechnic campus. Mesa attracts many employers, including Boeing and Banner Health. ASU’s Polytechnic campus was built in Mesa to connect students with the engineering and aerospace opportunities in the valley. Baseball fans can enjoy the Chicago Cubs spring training in Mesa as well. Other attractions include Golfland Sunsplash Waterpark, the Mesa Arts Center and the Mesa amphitheatre. Demand for business has never been higher thanks to the low costs associated with the city. There are several retail and office spaces available for entrepreneurs. Mesa’s large and growing population plus attractions make it an excellent location for an individual. Click here for a City of Mesa Market Report. The City of Chandler has Southern flare that attracts both residents and businesses. Originally founded as an agriculture town, Chandler was home to ranches and cowboys. Cotton, corn and alfalfa were the main commodities back in the day. Chandler hasn’t lost all of its ranching charm but has certainly developed and expanded in the past two decades. It is the fourth largest city in Arizona with a 2010 population of 236,123, growing 33.7 percent from July 2000 to April 2010. Chandler Fashion Square was added to meet shopping demands. The city has focused on arts development and opened the Chandler Center for the Arts downtown, which can seat more than 1,000 people. The Arizona Railway Museum is also a popular destination. The city is one of the fastest growing areas in Arizona thanks to the many companies that have opened facilities there including Intel and Verizon Wireless. Retail and office space is abundant in the growing city. Click here for a City of Chandler Market Report. Ahwatukee is an urban suburb of Phoenix, which is somewhat isolated from the rest of the city thanks to South Mountain and South Mountain Park. The 35.8 square-mile community has a population of approximately 88,500 residents with the average household income of $96,700.Its location provides many amenities for people nearby. Many enjoy the outdoor activities available to them. Hiking and cycling are popular pastimes along with golf. Ahwatukee offers over 600 businesses consisting of fine shops, boutiques, established companies and outstanding restaurants that work together to improve the quality of life for all who choose to live and work in this beautiful area. This suburb is a go-to location for families and small businesses. Click here for an Ahwatukee Market Report. Like the city of Chandler, Gilbert was originally founded for agricultural use. The city used to be known as the Hay Capital of the World. In the past two decades, Gilbert has grown tremendously attracting a young, affluent community. Gilbert was recognized in 2010 as the “36th Best Place to Live in the nation,” as well as among the nation’s “top places to live and learn” by GreatSchools.org. Gilbert has many options when it comes to having fun. The Gilbert Art Walk occurs several times each month and is free to the public. Visitors can look at local artist’s work in downtown Gilbert. The Big League Dreams Sports Park is another attraction. The park hosts soccer and softball games but is known for its replicas of famous baseball stadiums. Gilbert also has three top-notch medical care facilities: Banner Gateway Medical Center, Gilbert Hospital and Mercy Gilbert Medical Center. Businesses looking to be in a popular, growing area will find success in this city. Click here for a Town of Gilbert Market Report. The city of Glendale is the perfect location for sports fans. Its University of Phoenix Stadium hosts the Arizona Cardinals. The stadium is the location for the Fiesta Bowl and will host the Super Bowl in 2015. Glendale is also home to Arizona’s hockey team, the Phoenix Coyotes who play at Jobing.com Arena. For baseball fans, Glendale hosts spring training for the Los Angeles Dodgers and Chicago White Sox. Glendale is also home to one of four Arizona State University campuses—West campus. This location sees many commuter students who travel throughout the valley for classes. The city is the fifth largest city in Arizona with a 2010 population of 226,721, growing 3.6 percent from July 2000 to April 2010. With all the attractions, Glendale is an excellent location for office and retail space. Businesses can take advantage of a large population along with many tourists that will provide sale opportunities. Click here for a City of Glendale Market Report. This city that borders Phoenix was listed in Money Magazine’s “Top 100 places to live.” Peoria has been growing as more people relocate to the Phoenix valley. Peoria offers many amenities including Spring Training games with the San Diego Padres and Seattle Mariners. 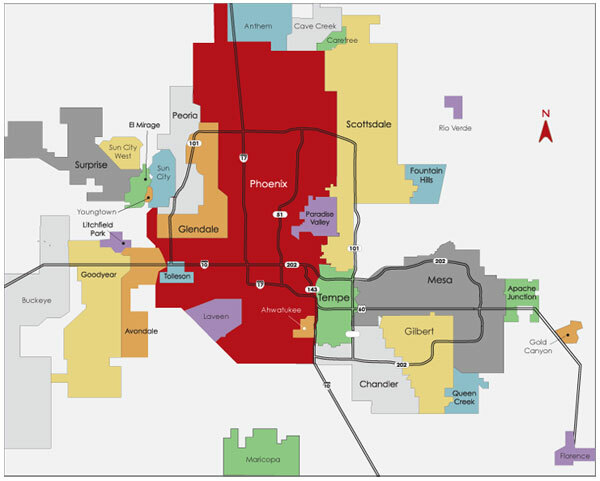 As the ninth largest city in Arizona, urban development is continually stressed. Peoria is trying to meet the demands of its growing population with the creation of a new freeway for industrial and mixed development use. Peoria offers an abundance of activities for residents and visitors. Many hiking options exist along with Lake Pleasant, which is a popular oasis destination for outdoor adventures and relaxation. Click here for a City of Peoria Market Report.